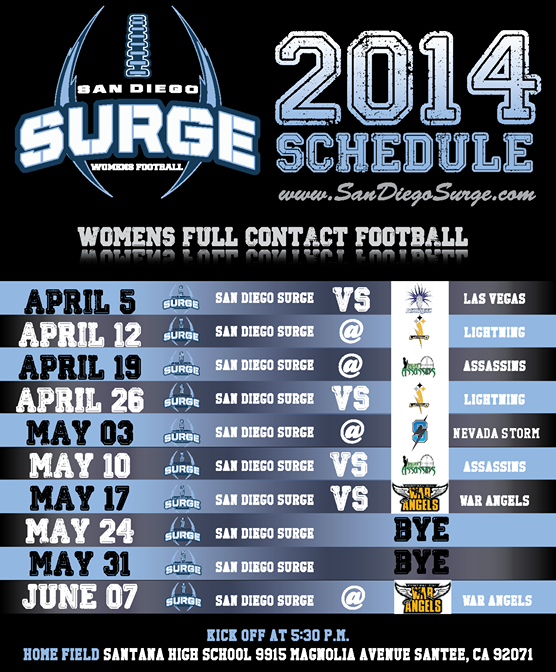 The San Diego Surge released their football schedule for the 2014 season of the Women’s Football Alliance. Coming off a 9-2 season in 2013, the Surge will play an eight-game slate that includes four home games at Santana High School. They begin the season at home on Saturday, April 5th against the Las Vegas Showgirlz. It will be the fifth meeting between the teams with the Surge owning a 4-0 lead in the all-time series. On the following Saturday, the Surge will kick off the first of two consecutive road trips when they take on the West Coast Lightning. The Surge will then head to Arizona for their fifth all-time meeting with the Assassins. After returning home for a rematch with the Lightning on April 26th, the Surge will be back on the road on May 3rd for their first-ever meeting with the Nevada Storm, a team making it's WFA debut after playing in the IWFL last season. Two straight home games will start with a rematch against the Assassins on May 10th; the Surge will then host the Central Cal War Angels on May 17th in what should be the most anticipated game on the schedule. The War Angels defeated the Surge 40-14 in last season’s WFA playoffs, forcing them to miss the National Championship game for the first time in team history. Following two weeks of rest, the Surge will get another shot at the War Angels on June 7th as they close out the 2014 regular-season on the road. In only three seasons of existence, the Surge has an outstanding record of 32-3. They appeared in two WFA National Championship games, winning it all in 2012. That success was under the direction of Mike Suggett who resigned as the team's head coach last October. The 2012 WFA Coach of the Year will be succeeded by William Harris, who helped build the program as one of the assistant coaches.